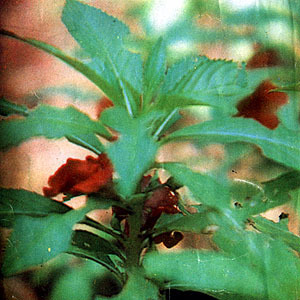 Kamantigui – Scientific name: Impatens balsamina L.
Leaves: glabrous or somewhat pubescent, 3 to 5 cm long, narrowly lanceolate or oblanceolate acuminate, deeply serrate, alternate, the petioles with basal glands as seen under a magnifying glass. Flowers: axillary, showy, 2 to 3 cm long, usually pink, but forms with white, red, purple, or variegated petals are also found in cultivation. The sepal spur is long and slender. The stamens are 5, filaments short, broad, anthers uniting. The ovary is 5-celled, the stigma, 5-toothed, the ovules many. Fruits: loculicidal capsules, pubescent and explosive when ripe. The seeds are small and rounded. Widely cultivated for ornamental purposes, throughout the Philippines. Leaves, sulfur and pectin; roots, peroxidase; seeds, oil and phenol. Roots, stems, flowers, and seeds. Snake bite, contusion, painful inflammation, carbuncles, dysmenorrhea, lumbago: use dried flowers, 3 to 6 gms or seed preparation, 3 to 7 gms or the entire plant, 9 to 15 gms, boil to decoction and drink. For external use on any bruise or painful area; crush fresh plant and poultice the affected parts of the body.